Pembrokeshire plays host annually to one of the most difficult triathlons in Wales – the Long Course Weekend. 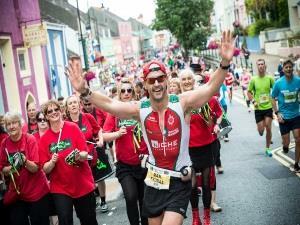 This unique event lasts three days in mid-July, accommodating some of the best triathlon talent in the UK and the world, including a number of IRONMAN UK athletes, serving as the perfect preparation and build up to the IRONMAN Wales event in September. To kick-off the weekend on Friday evening, the Long Course athletes have The Wales Swim to complete – a 2.4 mile swim that takes place on Tenby’s North Beach. On Saturday their attention turns to The Wales Sportive, and 112 miles of undulating Welsh countryside lined with enthusiastic crowds. To finish the weekend, the athletes have the small task(!) of completing the 26.2 miles of The Wales Marathon, which is quickly establishing itself as a fantastic event in its own right. See website for entry fees.